Different From The Traditional, These Meatballs Are Insanely Good! Ours is a house full of meatball fanatics, and these little babies have become the new official favorite. The meatballs alone pack some serious flavor, but after they’re coated in delicious creamy cheese sauce? It’s a little bit of heaven in your mouth. Ridiculously easy to whip up, this is an impressive dinner your family won’t soon forget. And should you manage to keep from polishing them off in a single sitting, (good luck!) they’ll freeze well for reheating. Although, we feel we should warn you, these bad boys may create a “shark frenzy” around the dinner table! Place ground chicken, Italian bread crumbs, egg, onion, garlic powder, 1/2 parmesan cheese (1 tablespoon), and salt and pepper in a large bowl. Use your hands to mix everything until just combined. Roll into 1 1/2 inch thick balls, (roughly the size of a golf ball). Heat olive oil in a large skillet over medium heat. Carefully add the meatballs and cook until brown on all sides. Test for doneness by breaking one in half with a spatula or wooden spoon. When meat is cooked all the way through (no longer pink), transfer to a large serving bowl, cover with foil and set aside. Melt butter in a medium saucepan on medium-low heat. Stir in flour to make a roux. Continue stirring until it turns a pale brown color and remove from heat. Stir in milk, a little at a time, until smooth. Place the saucepan on low heat and add smoked gouda, gruyere, nutmeg and cayenne. Stir constantly until cheese is fully melted, then remove from heat. 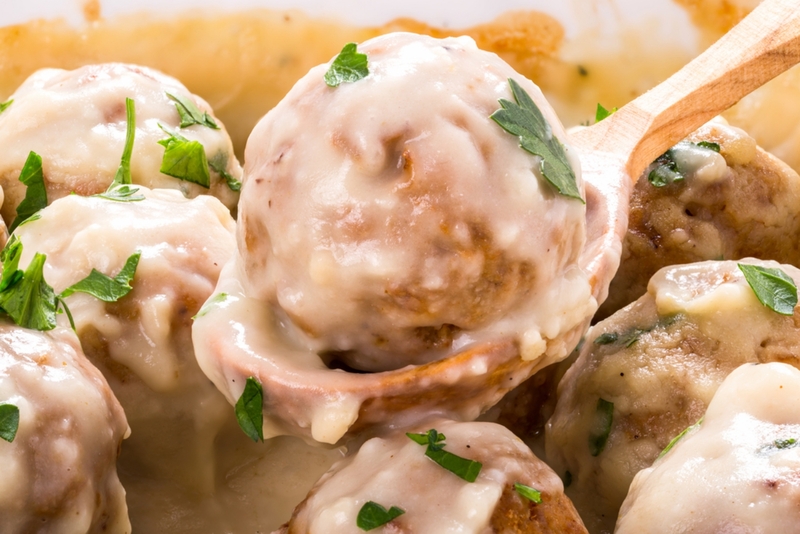 Remove foil from meatballs and pour cheese sauce over them. Use a large serving spoon to gently coat each meatball with sauce. Sprinkle in remaining parmesan cheese (1 tablespoon), garnish with chopped parsley and serve!